This experience is suitable for guests 5 years of age or older. 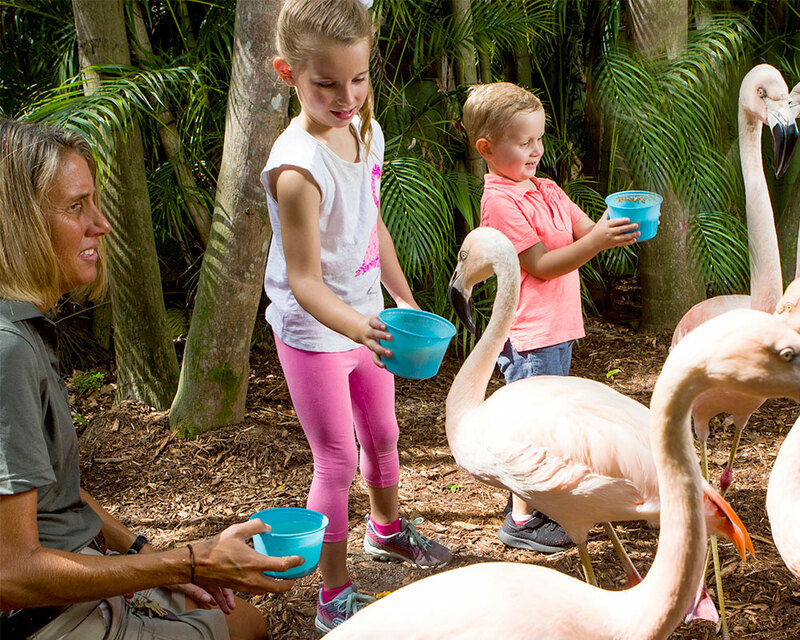 It's your chance to become a part of the flock in this fun and interactive experience with Chilean flamingos! You will learn interesting fun facts from the keepers who care for them daily. Participants will also assist in taking the flamingos for a walk (also known as our midday commute), weather permitting. Please note, participants are unable to touch the flamingos; however, you are able to feed them out of cups and get up close to snap some great photos! This one-of-a-kind experience requires advance registration and spots will fill up quickly, so reserve yours today! Experience fee does not include Zoo admission. Max 6 people per experience, mixed parties. Experience fee does not include zoo admission. Mandatory admission tickets for non-Zoo members must be purchased separately. Cancellations must be made 24-hours in advance of scheduled experience date to receive full refund. We will do our best to reschedule your trip. *Please note that no shows the day of your scheduled visit will forfeit all payments.